This a long haired goat breed is from the island of Corsica. The Damascus is a breed raised in the region of Syria and Lebanon, primarily for milk production. The Danish Landrace is derived from goats which have been in Denmark since ancient times. At the beginning of the 20th century, some crossing with goats from the German Harz region and Saanen took place. After the Second World War, the number of goats declined rapidly and a group of enthusiastic breeders collected some of the remaining animals. Unfortunately in the following years, many animals were used as recipients for embryo transfer of Angora or Boer goats or for crossbreeding with Boer for meat production. The Don breed was discovered in 1933-34 by an expedition of the All-Union Institute of Sheep and Goat Husbandry studying goats in the former Lower Volga territory. Because of its location, these goats were named "Don"; their habitat covers the basin of the Don river and its tributaries. The Don goats are of medium size; they have strong constitution, good conformation and adequate undercoat wool on the body, neck and belly. Males are larger than females and have a greater live weight. The average live weight of 3.5-4.5 year-old males is 70 kg (range 65-85 kg). The body shape is roundish and the skeleton is bigger than in females. Horns are large and variable in shape. Males back is long, straight and wider than in females. The average live weight of adult females is 36 kg (range 35-40kg). Kids weigh 2 kg at birth, 14 kg at weaning, 27 kg at the age of 1.5 years and 30 kg at 2.5 years. The Dutch Landrace is original goat race of the Netherlands and shows great similarity with other northwest European landraces as found in Scandinavia or the feral goats in Great Britain. The Dutch Landrace is a medium sized, horned breed preferably with long hair. All colors are allowed except for the typical Toggenburg coloration. The Dutch Toggenburg are a dairy breed which originated in the area of Drenthe in the Netherlands. This breed is found in the Saxony region of Germany where it is kept primarily for milk production. The Finnish Landrace is found primarily in western Finland. 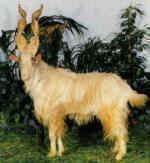 This Sicilian goat has very long horns, often 50 cm long and rising vertically in a corkscrew. The coat is long and creamy white with brown spots around the eyes. The Göinge goat is not breed for how much milk or meat they produce. The breeding selection is quite random exccept for the obvious effort to not breed animals who are to closely related. The Golden Guernsey is a rare breed which originated in the Channel Islands off the coast of Britain. The breed was developed from local breeds mated to Anglo-Nubian and Swiss breeds during a period from 1920 to 1950. The Hexi Cashmere is used primarily in the production of cashmere fiber. his is a long haired goat breed found in Ireland. The Jining Grey of Shandong Province, is noted for the attractive wavy patterns of its kid-pelt, which is the traditional commodity in internatinal markets. Does reased in temperate areas and with abundant feed reach sexual maturity at 3-4 months of age, and may give two kiddings a year, or three kiddings in two years. They are very prolific, with a average kidding rate of 294 percent. The Kaghani is a meat type that is found in the valley of Hazara district and surrounding areas in NWF Province, Pakistan. They are a large size with a white, gray, brown or black body coat. The Kamori is a milk type that is found in the districts of Dadu, Larkana and Nawab Shah in the Sind Province, Pakistan. The appropriately named Kiko goat was purpose-bred in New Zealand for meat production – the Maori word “kiko” meaning flesh or meat. The developers of the breed were Garrick and Anne Batten of Nelson in the northern South Island, and they developed the Kiko from feral goats that had been liberated or had escaped over the last hundred years or so of European settlement. These feral goats could be found in many places throughout the country, and although they were hardy, they were relatively small and produced little meat or milk. The fall of 1985 found the Showalters of Zederkamm Farm, Snohomish, Washington in a bind. Their old Nubian buck had died and left their two Nubian does without a mate. 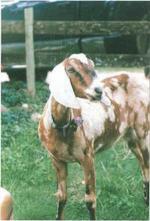 True, they had other goats including several Pygmies and the Pygmy buck was eager to be of help. So they bred the Nubians to the little fellow and in the spring of 1986 three little doe kids were born, the first Kinders. One, called Liberty, stayed at Zederkamm Farm, one was placed with a 4-H girl and the other went to live with Teresa Hill, a nearby goat enthusiast. The LaMancha goat originated in Oregon by Mrs. Eula Frey from short-eared goats of a type found not only in LaMancha, but throughout spain. It has excellent dairy temperament and is an all-around sturdy animal that can withstand a great deal of hardship and still produce. Through official testing this breed has established itself in milk production with high butterfat. The mountain goat is an even-toed ungulate of the order Artiodactyla and the family Bovidae that includes antelopes, gazelles, and cattle. It belongs to the subfamily Caprinae (goat-antelopes), along with thirty-two other species including true goats, sheep, the chamois, and the musk ox. The mountain goat is the only species in the genus Oreamnos. The name Oreamnos is derived from the Greek term oros (stem ore-) "mountain" (or, alternatively, oreas "mountain nymph") and the word amnos "lamb". The Moxotó is found in northeastern Brazil. The Murcia-Granada goat is a native breed originated in the southeast of Spain (Murcia, Almería, Granada and Alicante). Some years ago it was introduced to Argentina, Brazil, Mexico and Venezuela. Animal have also been exported to North Africa. In Spain it has been selected for rusticity, high performance and for its excellent milk production. 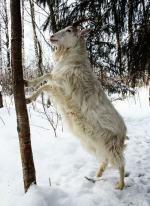 Myotonic goats are also called Wooden Leg goats, "stiff leg" or Tennessee fainting goats. These are one of the few goats that are indigenous to the U.S. There are two strains of this animal. Most of those found in Tennessee and the eastern U.S. are smaller. Most Texas herds tend to be somewhat larger, probably due to selective breeding for the meat market. In fact, some ranchers have renamed them Tennessee Meat Goats.